Carnival Funfairs provide a large amount of security for the events we co-ordinate or are affiliated with. These security measures include use of CCTV security cameras, security offices and security staff and wire security fences around the event perimeter. 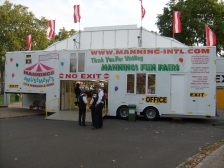 The Carnival Funfairs security offices provide a centralised location for our events. Carnival Funfairs can coordinate from here as well as it also serving as a help and information point. For our events, we use both fixed cabin and expandable truck style offices. 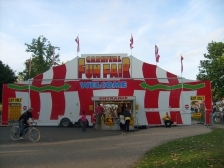 Carnival Funfairs gives a high priority to the safety of the people within the events it serves. This is why we also provide physical measures, perimeter fences and barriers to prevent unwanted guests from entering your private events and functions. The security staff provided at Carnival Funfair events have been trained to a high level, giving an air of safety and confidence in the events. The training undergone has given the security staff a high level of awareness in seeing potential situations and ability to approach and dissolve situations quickly and safely. Security staff can be easily found at our events as they are all wear highly visible uniforms. To complement Carnival Funfairs other security measures at events, we also install and erect high quality CCTV cameras. The security cameras are located in and around the perimeter of the event and stand approximately 12-14 feet tall and provide excellent surveillance and supervision to events and also act as pre-emptive protection to undesirable situations. Carnival Funfairs believe it is our duty to ensure the safety of our patrons and feel it is necessary to provide a high level of security so that you can fully experience the enjoyment of an authentic funfair.